RIT 6, New Hampshire 2: A 1-1 game quickly became a decisive 4-1 advantage midway through the second period. RIT capitalized three times in 94 seconds to put away the Wildcats. They extended their lead to 5-1 at 10:01 in the third before letting UNH get one back at 17:31. The final tally was an ENG. RIT becomes the first Atlantic Hockey team to reach the Frozen Four, and have done so in just their fifth season of D-I hockey. Boston College 3, Alaska 1: You have to hand it to the Nanooks. They hung tough with the Eagles all game. It was a shorthanded goal by Matt Lombardi that put BC up 1-0 midway through the first, and a power play goal from Andy Taranto that tied it up late in the second. BC scored the game-winner 3:46 into the third and added an empty-netter to seal the victory. Yale 3, North Dakota 2: North Dakota may have overcome a 2-goal deficit to St. Cloud State in the WCHA final, but giving up a 3-goal lead to Yale was too much to overcome. It wasn't the sort of furious rally that RIT blitzed UNH with, but a steady build, with goals at 5:48 of the 1st, 12:49 of the 2nd, and 17:46 of the 2nd. North Dakota mounted a comeback effort with goals in the early 3rd from Brett Hextall and Matt Frattin, but the Elis held off the Sioux for 16 minutes to win their first NCAA tournament game since 1952. Wisconsin 5, St. Cloud State 3: Four goals in the 1st, four goals in the 3rd, and an empty 2nd period. Wisconsin went up 3-1 in the first, and so it stayed until Jared Festler's shorthanded goal cut it to 3-2. Just under 3 minutes later, John Mitchell extended the Badgers' lead, but 10 minutes after that, the Huskies made it a one-goal game again. Aaron Bendickson's empty-netter finally put the Huskies away. Miami 2, Alabama-Huntsville 1: Miami's speed and size were far too much for UAH, but the Chargers acquitted themselves well. They just couldn't stay out of the penalty box. They were assessed 4 minors in the first, 3 in the second, and 3 more in the third, and it looked like Miami was on a power play even when they weren't. When Miami made it a 2-0 game 6:06 into the 2nd on Cameron Schilling's power play goal, it felt like the game was out of reach for Huntsville. They finally got on the board with a power play goal of their own (Fun fact: All goals in this game were on the power play) and made it a one-goal game, but there were only 38 seconds left in the 3rd at that point. Michigan 5, Bemidji State 1: If Huntsville spent a lot of time in the box, Michigan set up camp there. The Beavers took the first penalty of the night, which Michigan took advantage of. 5 seconds after Dan MacIntyre was let out of the box, Luke Glendening tipped Chad Langlais's shot from the point past Dan Bekala. After that, Michigan took 6 minors in the next 11 minutes (one was coincidental). The penalty kill and Shawn Hunwick worked wonders, and it looked like it was going to still be a tense 1-0 going into the 3rd, but Louie Caporusso took advantage of a 4-on-4 to give Michigan a bigger lead. Halfway through the 3rd, Bemidji finally cashed in on their 6th power play of the night. They caught Michigan scrambling after a failed interception attempt and kept the Wolverines off-balance long enough to get Ian Lowe open, and he put one behind Hunwick. Just two minutes later, however, Carl Hagelin and Kevin Lynch executed a gorgeous 2 on 1, Lynch making a perfect final pass with Bekala sprawling and allowing Hagelin a tap-in. Hagelin again had a gorgeous goal 3.5 minutes later. With Jeff Rohrkemper in the box for boarding, Hagelin took a perfect pass from Matt Rust to split two defenders and give him a breakaway on Bekala which he put away with a backhand. Lebler added an empty-netter to make it a 5-1 game. RIT 2, Denver 1: Clearly the biggest upset of the day. Denver, the overall #2 seed in the tournament, is taken down by RIT, a school that didn't play Division I hockey five years ago. The Tigers have stretched the nation's longest current winning streak to 11 games. UNH 6, Cornell 2: Cornell took the early 1-0 lead, and looked to stifle the Wildcats for the rest of the game, but UNH broke the dam with a puck that went through the net on a very sharp angle. Just seconds later, they followed it up with another one past Ben Scrivens. Cornell's defense continued to break down, leaving Scrivens in bad spots, and it was effectively over when the Big Red gave up an absurd, uncontested breakaway that Bobby Butler deposited behind Scrivens to make it 4-1. UNH and RIT will meet in the East final tomorrow night at the Times Union Center in Albany. St. Cloud State 3, Northern Michigan 2: The Huskies held the lead for most of the game, with Northern playing catch up. Eric Spady scored his first goal of the season with 4 minutes left to force overtime, and had the Wildcats some great chances, but St. Cloud State was able to draw a couple of (deserved) penalties and it looked like Northern was wearing down. They made it to the end of the first OT, but it only took seconds into double OT for St. Cloud to win their first NCAA tournament game ever. Wisconsin 3, Vermont 2: Vermont goaltender Rob Madore has played a great game, but this Wisconsin team is just loaded with talent. It's frightening to even think about having to play them. Madore faced a lot of grade A opportunities, and he's stopped most of them, but the Badgers were just too much. Geoffrion, Davies, et al look like a killer squad right now, and Gudmandson just stoned Roloff on a point blank chance. I'd be surprised if St. Cloud can upset them tomorrow night. I spent last Friday night in a cowboy bar in Houston, Texas. I was with my fiancee, talking with her friends and their significant others while listening to country music and watching people dance. Don't get me wrong; I like seeing them, and I was totally in favor of the evening. But the CCHA semifinal was going on at the same time. Every so often, my phone would chime, letting me know that I was getting another text message as Craig updated his status from inside Joe Louis Arena. I was terrified to look. Nothing good has happened to Michigan's hockey team this season when I was watching. They lost to Notre Dame and Miami in the only two games I attended and seemed to lose every time I watched them on TV. So I'd stopped watching, fearing I was a jinx. The second half of the season seemed to prove that it wasn't my fault, and at this point I was just worried that the other shoe was going to drop. Hard. Beating Lake State wasn't something that had seemed out of reach. Not a slam dunk, but not prohibitively difficult. Yes, Michigan had struggled through a disappointing season. They had losing records in November (Hi there, 5-game losing streak!) and in February (Not much of a stretch run there). Yes, they were starting a goalie who's 5'7" on a good day. But the guy had split against Notre Dame, so it wasn't out of the question. It was Lake State; even this Michigan team would be a favorite. And so they swept the Lakers and the worrying could really begin. The second round had seemed like karmic justice. You think you had us? Well, we wanted it more, and we came to end you. But this? This was Miami, a team that had dropped all of two games in conference play and had a pair of netminders any team would kill for. And so I sat in a bar and listened to my phone while the DVR recorded the game. I didn't look at the messages, but there were 10 of them sitting there, waiting for me. When we got home, I started watching it. It was late/early, but I couldn't wait anymore. The Tristin Llewellyn goal was a shocking thing, and it gave me hope. It was Lee Moffie's goal on the spectacular 4-1 that made me think we were going to win. I was too exhausted, and fell asleep when the second period ended, but I thought we had a chance to hang on. When I awoke in the morning, I was dumbstruck by the third period. Lynch, Lebler, and then Lynch again, pouring it on, just torching The Dynasty. And I felt something for the first time since October: Confidence. Northern Michigan was the last thing standing between Michigan and their 20th consecutive NCAA tournament appearance, and I couldn't imagine them letting the Wildcats get in the way. That doesn't mean that I wasn't worried; far from it. I was furious at the FSN Detroit stream as herked and jerked along, sometimes skipping 12 seconds of gameplay, mostly because I was terrified it was going to catch up and Northern Michigan would have put a goal in the back of the net. And so it went for almost two periods, feeling like another one of those nights where Michigan could outplay the world and have nothing to show for it on the scoreboard. But in the dying seconds of the second period, the stream lurched ahead and Louie Caporusso scored a power play goal. In the third period, the Wolverines clung to that 1-0 lead, and in the time it took me to restart the stream, Caporusso had scored one and Michigan gave it right back. It was a long, long 9:00 to end that game, rising to a crescendo with 3.5 seconds left and Ray Kaunisto cross-checking the hell out of someone's neck. And the refs called the penalty, and the game was over and Michigan was going to the NCAAs. The streak was safe. And now I want more. I want the same thing that I wanted when Craig and I bought our Frozen Four tickets a year ago: Michigan hockey at Ford Field. It can happen, obviously, but it's another mountain to climb after a huge weekend. Can Michigan retain its focus after that? Can the defense keep Shawn Hunwick clean? Will the puck keep going into the net for the offense? I have no idea. For non-Michigan fans, wondering who to watch, first and foremost you should keep your eyes on juniors Carl Hagelin (17-30--47) and Louie Caporusso (20-21--41). In addition to being the assists and points leader, Hagelin is a fantastic two-way player, usually dispatched to shut down the other team's top line. He plays left wing, with fellow junior Matt Rust (13-25--38) centering and freshman Kevin Lynch at RW. Caporusso is in the middle on the second line and a big force on the power play. The defensive pairings have been shaken up a bit due to the injury senior captain Chris Summers suffered in the CCHA first round versus Lake Superior State. A preponderance of sources think he's back for this weekend. Steve Kampfer (leader in points among defensemen with 3-19--22) is probably the second best of the D.
Shawn Hunwick is the story that everyone wants to talk about, and why not? Pint-size goalie, prone to concussions, just short of giving up hockey. But he's the brother of ex-Michigan defenseman/current Boston Bruin Matt Hunwick and he walks on when Steve Jakiel leaves the team. And when Bryan Hogan (2.33 GAA / .901 SV%) injures his groin halfway through the first period against Notre Dame, Hunwick steps in to finish the game and complete the 4-0 shutout. He also happens to have earned MVP honors at that CCHA tournament while watching a Hobey Baker finalist get benched on the other end of the rink. All eyes will be on him in Fort Wayne to see if he turns back into a pumpkin. Even if he does, I just want to say thank you to him and to the whole team for making it this far. I'll be there, cheering them on and hoping they can keep the season alive. Before you start, as always, we must point you to MGoBlog's Brian Cook's fantastic preview (http://mgoblog.com/content/puck-preview-bemidji-and-beyond) that is really more than any of us deserve. "Oh no, they're bitin' him, and stealing his pants." The observations of Carl Carlson are why we can never trust the beavers to be helpful. Last year, Bemidji State did two totally and wholly unexpected things in the NCAA Tournament. First, they became the first CHA school to advance to the Frozen Four, and second, they were such a Cinderella with a funny name in doing so that they got sports writers around the country to stand up and take notice of how much fun Hockey Christmas can be. It is a testament to Bemidji State this year that while they did not win the last CHA tournament, they became just the second team from CHA or Atlantic Hockey to earn an at-large berth in the tournament, and not just that, but earn a second seed as well. As the CHA moves in to the ethereal past of college hockey, where it joins UIC, Kent, Wayne State, and Northern Arizona as ghosts of what once was, Bemidji will look to honor the departed before starting a new chapter as a part of the W next season. The Beavers score goals in bunches (3.53 goals per game, admittedly with 18 games against the rest of the CHA) and as INCH points out, it seems to be a simple equation for Bemidji, score a lot of goals and win, don't score a lot of goals and potentially struggle. The key, it would appear, for any team wishing to shut down Bemidji would be to lock down junior forward Matt Read (who had Bemidji's only goal last year against Miami in the Frozen Four) and hope that you can make them play from behind and press. Even then, Bemidji has shown they can find the back of the net. I make no predictions, I bear no illusions that I know the future; but I do know that if the casual observer came across the college hockey bracket, they would likely see Bemidji/Michigan and presume that Michigan is going to roll in to a Regional Final showdown with Miami. But, that is not the storyline of this season. Michigan is the hotter team at the moment, no doubt, but momentum does not keep the puck out of the net, or keep you out of the box. It puts you in a good frame of mind (hopefully), and you look to build on it. Bemidji is 120 minutes from going from feel good Frozen Four fluke to team to be reckoned with. Overlook the Beavers at your own peril, because they're clearly not out there to rescue you. I want to give full credit to Miami. In just three short years, they have gone from "random occasional opponent in the CCHA best known as where Bo went to school" to "The Dynasty** (and I dislike them intensely.)" How do you do that? Well, you play like a house on fire. You earn 70 points in the CCHA this season. You have the best goalie in the league, arguably in the country. You have what seem like dozens of guys who can score at will, who play assignment hockey on the defensive end, and who look like they're giving everything they have every shift. You dislike them intensely because, dammit, they're good. I think it's the ultimate compliment, to be elevated to unlikable, because it means you're perceived as a threat. Miami can no longer be seen as a quick 4 point weekend (well, six now, but see, that is moot now, because they're not.) They're now a raging beast worthy of their campus being blown up by Hockey Bear coming to destroy us all. If you're looking for Miami to get back to the Frozen Four this season, your one worry has to be the fact that right when they need to be peaking, they are not. They're giving up more goals than usual, the CCHA Player of the Year Cody Reichard has not looked as good in the net of late, and while it would be untoward to speculate on the factors that have causes this slight derailment of the machine, the question has to be if Miami will find the form that made them look like a behemoth of a steamroller earlier this year, or is the team that has shown up lately, the team of a 4-3-1 record in their last eight games is who they are now. Just compare them across the bracket in the last eight games to Michigan, which is 7-1-0 in their last eight. Is Michigan the better team than Miami? Probably not, but based on recent performance, that gap has likely closed where it comes down to, if they were to face each other again, it probably wouldn't be a surprise if Michigan were to win again, but it also wouldn't be if Miami were to win again. A month and a half ago, I am not sure you could have said that. 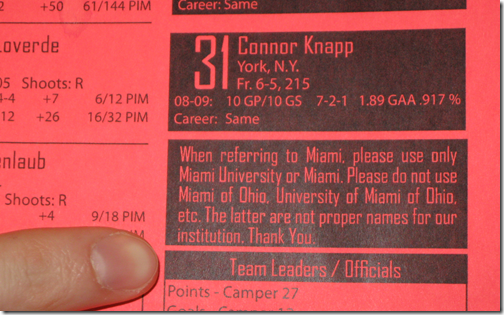 If Miami is going to win, the balanced scoring that they have employed all season will be critical as will Reichard returning to form, or Connor Knapp, the 77 inches of goaltender (as opposed to the 67 inches of goaltender that is Michigan walk-on wunderkind Shawn Hunwick.) can stop all that faces them. If Miami can regain some momentum against Alabama-Huntsville, they could be an angry and dangerous team in the Regional Final, difficult for any team to knock out. Oh there are many people who likely lament that this year's edition of Alabama-Huntsville is the argument against why the NCAA tournament automatic bid should go to the regular season champion, and not the playoff champion. We are not among them and we're not ashamed to admit why. But just as CHN's Adam Wodon has pointed out that without the bids from the CHA and Atlantic Hockey, college hockey fans would still be looking at a 12 team tournament. So let's credit the Chargers for getting hot at the right time, and winning a tough overtime game against Niagara, at Niagara. What is the Chargers' reward for this effort? An opening round date with the tournament's overall top seed; the RedHawks of Miami University. This may seem daunting, but remember, it was just three years ago, the Chargers, also coming in with a losing record, gave overall top seed Notre Dame a major scare before falling to the Irish in double overtime. The biggest storyline of the game for UAH will be the fact that they're the last surviving remnant of College Hockey America and that they're facing a team from the CCHA, the conference which rejected their request for membership last season. They'll be an independent and they'll do their best to scrape out a living as such as an independent. USCHO suggests that you should root for them only to root for chaos, and HSR always supports rooting for chaos. Plus, well, no, it's Hockey Christmas and you do not speak of scenarios which could be beneficial to your team. Everything stacks up that the Chargers will likely have a long night ahead of them, but if you have a hot goalie (like Cameron Talbot, the CHA Tournament MVP) and a little luck, the underdog can rise up and steal one, or more. Remember, just last year, two #4 seeds won a pair of games and ended up in the Frozen Four. One was a CHA team, the other was UAH's first round opponent. It's single elimination, anything can happen. This year's Badgers are a high-flying crew. By the numbers, they're the second most potent offense in the country, at 3.97 goals per game. And they're doing it against the fourth-toughest schedule in the nation, whereas Yale (4.09 GPG) faces the 37th. Seven different Badgers are in double digits when it comes to goals, led by senior Hobey Baker finalist Blake Geoffrion (25-18--43), 13 of whose have come on the power play. Senior Michael Davies (18-32--50) leads the team in points, while sophomore Derek Stepan (10-38--48) is tops in assists. Five Badgers have at least 30 points. Junior Brendan Smith (15-30--45) is also a Hobey finalist and leads all defenseman nationally with his 15 goals. He's made the most of his power play time, having earned 11 of his goals that way. He also leads the team in penalty minutes with 70. On the other end of the ice, Wisconsin is anchored by junior goalie Scott Gudmandson, with his .915 SV% and 2.31 GAA. He's split time with fellow junior Brett Bennett (.885/2.31), who's appeared in 14 games, but I'd expect that Gudmandson will be the goalie for the NCAA's. The top defensemen in +/- are junior Ryan McDonagh and sophomore Jake Gardiner, who lead the team with +21. McDonagh is also right behind Brendan Smith with 69 PIM. The Badgers are a deep, scary team. A goalie having a good night can get them, as they've been shut out on a couple of nights, most recently in the WCHA tournament semifinal against St. Cloud State, but it doesn't happen often. They've only been held to one goal 3 times. One of those was also against the Huskies, which is about the closest anyone's been to having Wisconsin's number (The Badgers are 2-3 against them on the season). As luck would have it, St. Cloud State is also in the West regional. I'm sure Wisconsin would be happy to level the season series. Mark Olver. Know this name. Know this name is missing an "i". Know this name because he is the rare Hobey finalist for the boys from Marquette and he is playing like it, averaging better than a point a game. He centers a second line that is as strong as Northern's top line and will potentially give opponents fits, provided the Wildcats can stay out of the penalty box. One potential positive for NMU will be no CCHA or WCHA refs in their regional, it'll be interesting to see if Northern can play physical yet clean in the eyes of the officials and give themselves a number of chances to score on even strength. If Northern is going to make the most of their first tournament appearance since 1999 and cross the Mackinac Bridge down to Detroit one more time this season, they'll need goalie Brian Stewart to be at his best. If he is, it would be, in the words of Northern Michigan alumnus Lloyd Carr, tremendous. * - Old Man Soapbox for a moment. Michigan student hockey fans, I sincerely appreciate your passion and generally I will allow most of what you say slide because I was once like you. But the chant of "Stupid Yoopers" at the CCHA Final on Saturday night was untoward and out of line. It's Northern Michigan, and yes, I know they stood in the way of Michigan making the NCAA tournament and another CCHA championship, but really "Stupid Yoopers"? Did NMU deserve that? Even "Silly Yoopers" would have been far more acceptable. Save the true vile for those who would denigrate the name of Michigan, please? OK, off the soapbox as I have to go shoo some kids off my lawn. In their eighth appearance in the NCAA Tournament, St. Cloud State is clearly the guy in the PG movie everybody is rooting for* instead of the guy in the R rated movie you're not sure about. Seven previous appearances have led to seven disappointments, ranging from consecutive losses to Michigan in 2001-02 (leading to, among other things, "the Molly situation**"), to a 2-1 loss to Clarkson in Albany in 2008. St. Cloud will look to build off a strong Final Five run that saw them lose in the championship game, a outline similar to their opening round opponent, Northern Michigan. One positive note for the Huskies: This game will mark their first NCAA tournament game in the state of Minnesota and will be playing on the same ice where they just skated in the Final Five last weekend. * - Gopher fans cheerfully excluded from this "everybody". ** - Yes, we probably discussed this in 2008 when SCSU qualified. We don't care, it's that good of a story. *** - "Let's Go Hockey!" will forever be associated with the Huskies here at HSR after the 2001 Regionals at Van Andel Arena in Grand Rapids when part of our traveling party misheard the SCSU chant of "Let's Go Huskies" as "Let's Go Hockey" and appreciated the desire of St. Cloud fans to promote the game. The Vermont Catamounts don't appear in the top 10 of any major statistical category as a team: Not defense, offense, power play, or penalty kill. Their RPI is the lowest of the 4 teams tied at 11th in the Pairwise. In conference, they only went 9-11-7 to finish 8th in Hockey East (to be fair, only 3 points separated them from 3rd). They don't have a goaltender in the top 28. They don't a skater in the top 50. But they do have wins over Denver, Boston College, Yale, Minnesota-Duluth, and their victory over New Hampshire in the Hockey East first round lifted them into the tournament, so they clearly aren't a team to be taken lightly. Yale and Air Force can answer for that from last season, when the Catamounts clawed their way into the Frozen Four before falling to eventual champion Boston University, 4-5. Senior Rob Madore is the top netminder for the Catamounts. His .908 SV% is only down .004 from his junior season, but his GAA is up a whole .3 to 2.65, indicative of the 117 extra shots he's seen this year. On offense, Vermont is paced by senior forward Brayden Irwin (15-19--34), the team leader in the big 3 categories, plus power play goals (7) and penalty minutes (66). Fellow senior Colin Vock (11-17--28) is the only other Cat with double digit goals. Senior defenseman Patrick Cullity is by far the +/- leader (+19). Junior forward Justin Milo (9-12--21) is the only player over 1 ppg, but he was dismissed from the team in February for unspecified reasons. Even as the Hockey East regular season champion, New Hampshire was one of the last at-large teams in the tournament, sitting in a 4-way tie for 11th in the Pairwise with Michigan, Vermont, and Alaska. The Wildcats were left on the sidelines, unable to influence their own destiny, after losing a crazy first-round series to Vermont. UNH won the first night 7-4, then consecutive 0-1 losses gave Vermont the series win. But things broke the right way, and they're headed to Albany. Senior forward Bobby Butler is a Hobey Baker finalist and leads the Wildcats in most of the big statistics. He's first in goals (27), points (50), and even +/- (+23). He's putting up 1.35 points per game. Junior forward Paul Thompson (17-19--36) is the runner up in points, and sophomore defenseman Blake Kessel (9-26--35) is the leader in assists. Junior defenseman Mike Beck is second in +/- (+13) and seems like the stay-at-home type (1-6--7). New Hampshire has not been an elite defensive team this year. They let in 3.08 goals per game overall, with senior Brian Foster at .910/2.95. He's seeing about 33 shots per game. Things to do in Denver Albany when you're a #1 seed. Making their 20th appearance in the tournament, Denver had been near the top of the heap all season, falling out of the #1 spot in the poll on the last weekend after suffering back-to-back losses for the first time all season in St. Paul at the Final Five. As one might expect from Pioneers, the trip to Albany will be the first sojourn east for Denver this season to face a team with which they are wholly unfamiliar. George Gwozdecky is saying all of the right things, noting how Michigan was taken out by Air Force from Atlantic Hockey last season in the first round and RIT would be more than happy to do the same, playing just four hours from home. Though the game is not played on paper, one would have to like Denver's chances when you look at the numbers. The Pioneers have an exceptional top lined, paced by a pair of 20 goal scorers in Rhett Rakhshani and Joe Colborne, and they have a Hobey candidate in net in Marc Cheverie. The biggest question will be if Denver can find scoring beyond their top line, which is accounting for almost half of the team's goals, or if they will need to even find it. Bow down before your Ivy League overlords, the masters of two sports! The only school in the NCAA Men's Hockey Bracket with a team in the Sweet Sixteen for basketball*, this could be a weekend of sports nerd-vana for the Ithacans. On Thursday night, the Big Red will stare down the Wildcats of Kentucky in a Regional Semi-Final game at the Carrier Dome in Syracuse, a mere 60 miles from campus. The next night, the Big Red play in Albany against New Hampshire, leading to the tantalizing (or nightmarish) prospect of trying to be in two places at the same time as the basketball regional would tip off at 4:30 in Syracuse and the hockey team would drop the puck at 6:30 in Albany. But, one step at a time. The Big Red have one other major advantage, they're playing in Albany for the second straight weekend against New Hampshire, a team that has a big home rink. Knowing the boards, the nuances and bounces, might just be enough to help Mike Schafer return to the glory days of Ned Harkness, when Cornell was "the" hockey school in the East and more than just a "nice story". *--Yes, Wisconsin fans, if the Badgers had beaten Cornell, they would hold this distinction this year, but they didn't, did they? The RIT Tigers, like Bemidji, had moved up and down between Division II and Division III, winning DII titles in 1983 and 1985, before dropping back down to Division III until the 2005-2006 season. The Tigers existed as an independent for that season before joining Atlantic Hockey, and quickly established themselves as a force in that league. In their first season, they won the Atlantic Hockey regular season title, and would've been a strong contender for more, but were ineligible for postseason play, due to their recent move up the food chain. Instead, they've had to wait. They won the conference regular season last year, but fell in the conference semifinal to Mercyhurst and didn't have the resume for an at-large bid. This year, the Tigers won the conference by 10 points and blazed through the conference tournament. They've won their last 10 straight, including OT wins over UConn and Air Force. The Tigers are led in all offensive categories by sophomore Cameron Burt (15-30--45), with junior Andrew Favot (13-28--41) not far behind. Senior defensemen Chris Tanev (11-23--34) and Dan Ringwald (9-18--27) are actually #3 and #4 in scoring and lead the team in +/- (+32 and +22, respectively). Senior Jared DeMichiel is the unquestioned #1 netminder with a .922 SV% and 2.00 GAA. You may have noticed over the past couple of days, but we're getting our act together to bring you our annual set of previews for each team in the NCAA Division I Men's Ice Hockey tournament. We're a little late on the draw this year, but a.) When your team looks like it's about to miss the tournament, you don't feel like getting your previews ready ahead of time, and b.) When your team completes a Cinderella run through the conference tourney to clinch an NCAA bid, you're suddenly a lot more excited and want to make those previews better. We hope we've succeeded. We're back! The Bulldogs of Yale return to the tournament for a second straight year, leading to much Boola Boolaing among the blue-clad old guard. Their loss to an upstart Brown team in the ECAC quarters has given the Elis two weeks off to prep for a matchup against arguably the hottest team in the nation in North Dakota. Yale will be looking for a better outing than last year, when as hosts in Bridgeport, they were felled by Vermont in the opening round. Yale's biggest headline this year is probably one that they would prefer you didn't know about, losing 21 goal scorer Sean Backman to a foot injury, later confirmed to be an injured heel in an unauthorized after-hours incident at a school pool. (You may feel free to be judgmental about horseplay and think "I told you so" here as you are reminded of former Michigan goalie Josh Blackburn's injury that occurred in the 2001-02 season when he "slipped on a buckeye nut while moving a refrigerator.") The Brown series was the Elis first without Backman and it will be interesting to see how Coach Allain utilizes his third line, considered a hidden strength by observers on campus, to get the scoring punch he'll need. Coach Allain will be returning home to his native Worcester for the regional and look for the Bulldogs to go against the blue-blood stereotypes of Yale, instead playing a blue collar style that will feature active sticks, muddled passing lanes for opponents, and solid back checking. This time of year, that might be just the trick to upsetting the Sioux. Last year, Alaska found itself on the outside looking in. Behind a stingy defense and superb goaltending from senior Chad Johnson, it had secured a first-round bye in the CCHA playoffs and home ice in the second round, which it used to eliminate Ohio State in a hard-fought 3-game series, winning the rubber match 1-0. But the Nanooks ran into Michigan in the CCHA semifinals and then dropped the third place game to Northern Michigan, which left them on the wrong side of the bubble. Still, it was a successful first year for coach Dallas Ferguson, and the Nanooks have built on it to earn the program's first ever trip to the NCAA tournament. Chad Johnson was practically irreplaceable, with his .940 SV% and 1.66 GAA, but sophomore Scott Greenham is sporting a respectable .918/2.20. One area of considerable improvement is on the offensive side of the ice. Last year's team desperately needed Johnson, as they scored only 1.90 goals per game. This year, the Nanooks are up to a much healthier 2.82 GPG. They're led in goals and points by senior center Dion Knelsen (19-23--42), who nearly doubled his team-leading 10 (10!) goals from last year. Freshman RW Andy Taranto (17-24--25) is the leader in assists and penalty minutes (50). And then hockey bear destroyed the world, was trapped in an underwater ice prison, escaped, sunk a freighter, and flew an F-16 that bombed MSU, OSU, and Miami, before blowing up the Earth. BC was beaten out of the Hockey East regular season title by a single point, but the Eagles took down UMass and Vermont en route to a wild 7-6 overtime victory against Maine and the Hockey East conference tournament title. Apart from a rough January, where they went 4-5, the Eagles haven't dropped more than two games in a month. They won the Beanpot again this year over BU, revenge after dropping the January 8 outdoor game at Fenway Park. The Eagles are two years removed from their 2008 national title in Denver, but one year removed from missing the tournament entirely. Junior goalie John Muse returns from the title team, carrying a 2.43 GAA and .909 SV %, which is slightly more pedestrian than the 2.20/.921 of his freshman campaign. He's split time with freshman Parker Milner (2.32/.909). On the offensive side, sophomore Cam Atkinson leads the team in goals and points with a 24-22--46 line. Junior Brian Gibbons (15-29--44) is the assists leader. Junior defenseman Brian Dumoulin is an eye-popping +27 on the year. On February 12, North Dakota had just lost to St. Cloud State to drop to a record of 13-11-5. It wasn't an unfamiliar spot for the Sioux, who've had to make furious stretch runs in past seasons, like in 2009, 2008, 2007, or 2005. But the 2010 team outdid those, winning 12 of their last 13 games (including the WCHA Final Five championship) to go on an absolute tear and grab a two seed. The Sioux are led in points by senior Chris VandeVelde with a 16-25--41 line, exactly 1 point per game, and sophomore Jason Gregoire (20-17--37) leads the team in goals. Junior Evan Trupp (8-26--34) is the assists leader. He'd been held without a goal for 20 games until the Thursday night play-in game at the Final Five, when he lit the lamp against Minnesota-Duluth. He followed that performance with a pair of goals against Denver in the semifinal game. Trupp was named MVP of the tournament. North Dakota has had a bad run of luck with post-concussion syndrome the last two years. Last season, senior defenseman Joe Finley missed two months with lingering symptoms following the GLI. This year, senior defenseman Chay Genoway has been missing time since November when he went down in a game against St. Cloud State. Is your NCAA Tournament bracket busted? Are you looking for a shot a redemption? Don't want to end up a cartoon In a cartoon graveyard? Well, I present the 2010 NCAA Hockey Christmas Tournament Challenge. So, if you would like to play, just submit to me, via message, in the comments below, or by some other means, by Friday at noon, your four teams. No money, no prizes, just for pride. Also, please, by all means, tell your friends.